Cut the eggplant in half, place on baking sheet and bake for 30-40 minutes – until soft. Remove from the oven, let cool, and scoop out flesh, discarding skin. Mash the eggplant until smooth. Add the tahini, the garlic, 1 tablespoon of lemon juice and the cumin and mix well. Season with salt, taste, and add more tahini and/or lemon juice, to suit your taste. Drizzle with a little olive oil and garnish with parsley and olives if desired. Serve with chopped vegetables, rice crackers or pita bread. 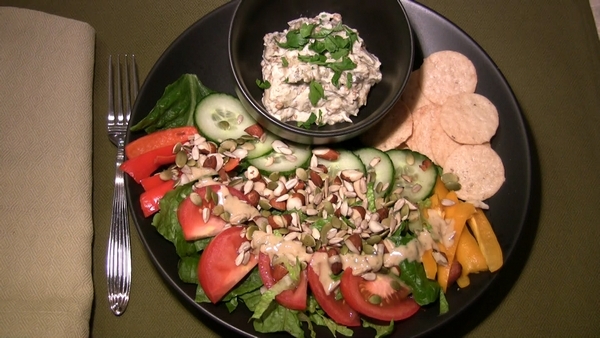 Serve with a mixed green salad topped with nuts and pumpkin seeds.